I've been editing clips for my next episode, and came across a few bizarre claims, that "PETA MEMBERS ALL WANT TO KILL *YOUR* PET CATS AND DOGS!!!!!111!!! ", and also that "ALL HIGH UP PETA MEMBERS LOCK THEMSELVES IN THEIR BOARDROOM AND ROLL ABOUT ON PILES OF CASH, SCROOGE MCDUCK STYLE, WHILE EATING MEAT AND LAUGHING MANIACALLY!!!111!11!!". I THINK ITS TIME I TURNED OFF CAPS LOCK, ok there we go, I think this is INCREDIBLE, that anyone could publicly make such accusations, and I would like to debunk these as best as I can on my next episode. These were from "Alex Jones" of course, ( http://en.wikipedia.org/wiki/Alex_Jones_%28radio_host%29 ), Mr "911 was an inside job to get children hooked on government healthcare!". I'd like to play as many quick clips as I can receive. "My name is Jordan Wyatt, I'm an animal rights activist and I do not go about killing neighbourhood cats or dogs, I also do not secretly scoff (eat) animal by-products when I think I'm alone"
*Of course, I have to take you for your word, if you really do prowl the streets for cats/dogs to "put down", secretly consume animal products, or rent hotel rooms for a weekend of watching tv, paying $10 for a can of minibar Coke and wearing leather, please refrain from submitting a clip! Wouldn't it be easier to just state "I have nothing to do with PETA because they are not animal rights" or words to that effect? I will never defend PETA, I just completely disassociate myself from them. If you are asking us to send in clips to debunk myths about so called "animal rights activists" that have been exacerbated by the antics of organizations like PETA then that is another matter entirely. I make it QUITE clear that I want NOTHING to do with PETA, yet they are the massive corporate entity that is intrinsically linked to "Animal Rights" in most American's (the world's?) mind. 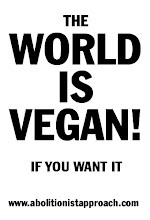 When non-vegans hear "PETA", they think "Animal Rights Radicals", and vice versa. I personally would not believe half of what is said about PETA by "anti-animal rights persons", for example, PETA members wanting to kill YOUR cat/dog... meaning instead that PETA believe in "fixing", like all other Welfare organisations, and that PETA's president Newkirk has mentioned publicly about NOT HAVING PETS. Which was spun out into "she wants to kill my cat Mittens!". My point was to have a little bit of fun, a complete miss apparently, by pointing out that even if PETA is FOURTEEN PERCENT (random) as crazy as purported, we are NOTHING to do with them, we would be "coming out" as having against these insidious plots. I agree completely with Liz. I'm all for animal rights activists disassociating themselves from PETA, since a lot of the accusations lobbed at PETA are (unfortunately) actually true.